WOW Lavender & Rose Skin Mist Toner is a perfect toner for your daily CTM routine to give your skin a healthy and glowing glow. It balances, hydrates, protects and refreshes skin while tightening pores and restores skin's inner radiance. Forms a protective shield to keep acne-causing dirt particles away. Soothing-seductive floral fragrance that bursts stress and lifts up your mood. Regular use also helps lighten blemishes and keeps signs of aging at bay. Totally free of harmful Alcohol, Sulphates, Parabens, Mineral oils and synthetic fragrances. Additional Information: Based in Bangalore, India, the brand WOW is known for their trusted natural and premium quality products. Your one-stop destination for all health, grooming and beauty needs, the brand product portfolio includes dietary supplements, herbal blends, skin care products, bath & body products, men's grooming products, essential oils and much more. Be assured of getting only the purest and high quality products powered by natural bio-active ingredients and free from artificial additives or harmful synthetic chemicals. Explore the entire range of Toners & Mists available on Nykaa. 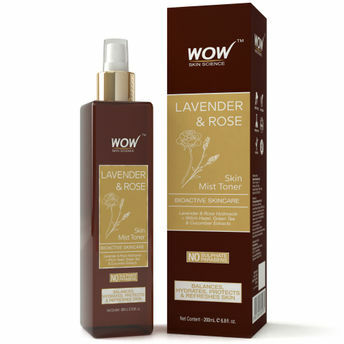 Shop more WOW products here.You can browse through the complete world of WOW Toners & Mists .